Research literature in the field of teacher emotions and change broadly accepts that behaviour and cognition are inseparable from perception and emotion. Despite this, educational reform efforts tend to focus predominantly on changing individual behaviours and beliefs and largely neglect or at best pay token attention to the emotional dimensions of the change process. This study examines teacher emotions in the context of educational reform and focuses on the role emotions play when teachers transfer new instructional processes into their practice. The teachers involved in this study took part in a four year systemic change professional development program designed to refine and extend their instructional practice. 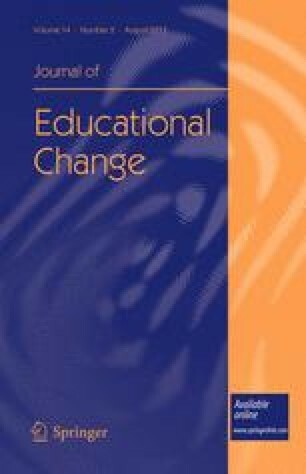 A sequential mixed methods research design consisting of the administration of a quantitative questionnaire followed by in-depth qualitative narrative interview analysis was used to gain insight into this complex area of educational change. Findings revealed that the teachers involved in this study experienced a range of emotions when participating in professional development and their emotional responses directly impacted their use of new instructional processes. A cyclical pattern of emotions emerged influenced by time, place and interpersonal relationships. Implications for the future design and implementation of professional development change initiatives are discussed. Horsely, D. L., & Loukes-Horsley, S. (1998). CBAM brings order to the tornado of change. Journal of Staff Development, 19(4). http://edweb.fdu.edu/faculty/GlickmanE/8704_SummerA_05/CBAM%20%20change.pdf. Accessed 21/02/12.